Spouting off on stuff that interests me. 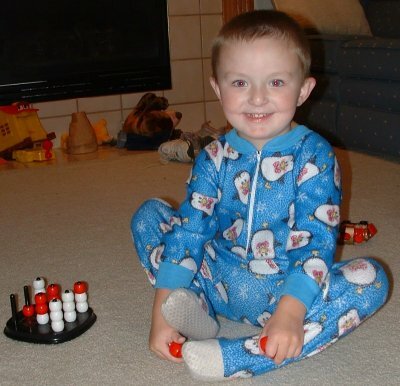 This is a picture of my son in his favorite pajamas, the “Tux Jammies”. Ever since he ask which jammies were my favorite, and I answered the Tux jammies, they are now his favorite (sometimes even to the point of demanding that Mommy wash them during the day so that he can wear them twice in a row ). Wired published an article titled “Scientific Method Man” regarding Gordon Rugg’s solution to the problem of the Voynich manuscript (a manuscript written in a code that has not been broken for 400 years). His solution was to prove that the manuscript was a hoax. To do so required some creative, out-of-the-box thinking, and a challenge to the dogmatic thinking of the experts in that domain. Inspired by a wired article I googled for a Vedic Math tutorial. I have always found these little math tricks interesting, mainly from the perspective of trying to figure out how they work. I think it is a kind of a mental excersize similar to figuring out a clever optimization algorithm in programming. Marcus Baker, author of SimpleTest and oop/pattern guru extraordinaire at the SitePoint Advanced PHP forum has just had release 1.0 of Bryn Reuben Baker, a strapping young man of 8 lbs. 4 oz. born at 1:48AM July 30th, 2004. Wired recently published an article regarding users avoiding site registrations by providing fake data, or using a shared login (a technique which is apparently being facilitated by bugmenot.com). My own personal technique has changed since I rebuilt my home server. Since I now run qmail, I simply set up an alias (usually the site’s name@my domain) to give them. If they sell it 👿 and the alias starts to attract spam, I will just delete it :). Regarding the original articles premise, what ever happened to just dropping a cookie to track usage? By mentioning me in his blog, Jeff Moore has officially welcomed me to the blogosphere! This seems apropos, since Jeff was motivational in both my investigation of RSS (I finally gave up the notion that is was a fad, now I can no longer remember what it was like to randomly surf for information on the internet 😉 ) and his use of WordPress, along with comments from Harry and other reviews led to me selecting WordPress as the tool to host this blog. That my strategy of backing up db dumps and important config files to another partition of the same drive does not do you any good if the hard drive controller goes. Note to self: time to bone up on rsync. I did have some backups burned to CD and replicated to another HD on a different computer, but they were woefully out of date. I found an identical model HD on ebay and purchased it for $24.99 + $7.00 SH. When the drive arrived, four screws were all that held the controller board onto the drive, and a quick swap allowed me to access the old HD contents. Critical files were quickly copied across the network, and the entire drive was replicated later that night. What was my recovery plan? Well, here we have it, Jason’s first foray into the wide world of blogging and RSS. I intend to use this space mainly for matters related to my interests in computers, which right now centers on web development in PHP. Tangentally realted to that would be my favorite Linux distribution, Gentoo. 22 mySQL queries in 0.350 seconds.